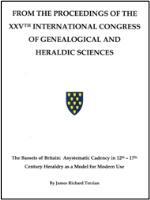 The Bassets of Britain: Asystematic Cadency in 12th – 17th Century Heraldry as a Model for Modern Use by James R. Terzian, published in The Proceedings of the XXVth International Congress of Genealogical and Heraldic Sciences (held September 2002). Forthcoming on CD-ROM, 33 pages and 11 illustrations. James R. Terzian, Executive Director of the Heraldry Foundation and Editor of the Basset Millennium Genealogy Project, has begun this series of monographs on Basset origins and branch histories. Asystematic Cadency is written principally for the heraldic community as a study of Basset heraldic differentiation. It contains summary overviews of many family branches, and explanations of the Basset coats of arms used in England, Ireland, Scotland, Wales and the new world prior to the English Civil War. Mr. Terzian has developed a database of Bassets of Anglo-Norman origin during this period and a collection of known Basset heraldry past and present. This and future monographs detail the results of his studies. The Bassets of Sapcote: A Record Covering Early 12th Century to the late 16th Century AD by Miss E(lizabeth) Linford, unpublished (given to the Leicestershire Record Office prior to 1975). Manuscript, 53 pages. The Bassets of Sapcote began with William (d. 1185), third son of Sir Richard Basset (Justiciar of England) and his wife Maud Ridel, whose principal home was the manor and castle of Sapcote. The line continued for seven further generations to Ralph, 1st Lord Basset of Sapcote (d. 1378), whose two daughters divided the representation and lands, marrying into the Motons of Peckleton and Greys of Codnor. Miss Linford gathered all primary and secondary evidence generally available on this line and used it to compile an annotated narrative genealogy. Appendixes discuss the continued representation of the family by the Greys of Codnor and Zouches of Harringworth, and the disposition of other Sapcote lands that passed to the Zouches of Harringworth and through Alice, Ralph Lord Basset of Sapcote’s widow, to the Mallorys of Kirkby Mallory. Genetics and Genealogy:: The Bassetts of New England: A Comparison of Five Early Immigrants by Jeffrey N. Bassett. 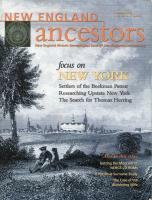 Published in New England Ancestors, the magazine of the New England Historic Genealogical Society, Spring 2004 (Vol. 5, No. 2). 2+ pages and DNA chart. Jeffrey Bassett, editor of the Bassett Family Newsletter and Director of the Bassett Surname DNA Study, wrote this first of many articles expected from users of the Bassett Surname DNA Study’s data. Focusing on five 17th century immigrants to New England with the Bassett surname, the author used Y-chromosome DNA to assess their possible interrelationships and likely areas of origin in England. His success and the interest of those who participated in the DNA testing led to the project’s being expanded, and its growth into a leading One-Name research program working with Bassetts in Europe, North America, the southern Pacific and elsewhere. The article summarizes the program’s early results and illustrates how Y-chromosome DNA testing can be used to practical effect in genealogical research.